To feel the feelings and the pain of a little heart that needs a healing is indescribable. It is beyond comprehension as to how it is for a little heart that weeps desperately from within to beg for life lying in a hospital cot, due to heart ailments. 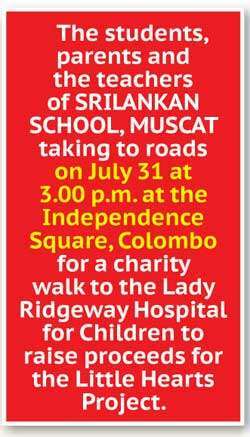 In such a backdrop, the students, parents and the teachers of SRI LANKAN SCHOOL, MUSCAT taking to roads on July 31 at 3.00 p.m. at the Independence Square, Colombo for a charity walk to the Lady Ridgeway Hospital for Children to raise proceeds for the Little Hearts Project organized by the Paediatric Cardiac Unit of the Lady Ridgeway Hospital in Colombo. 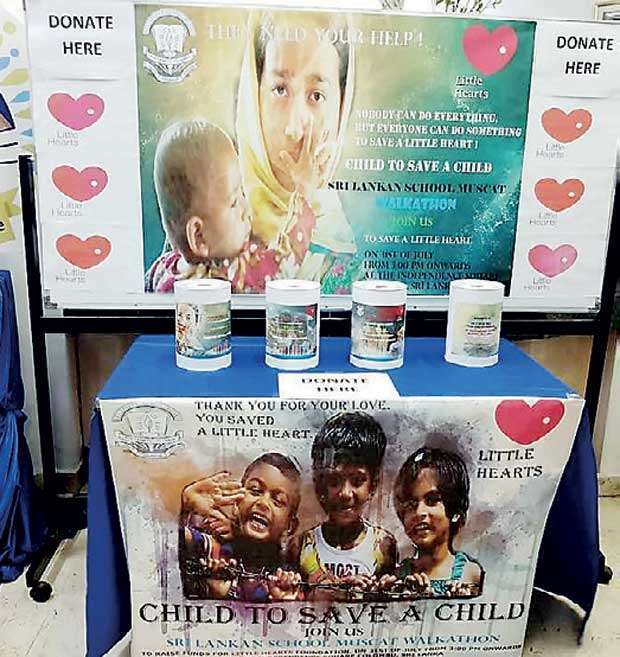 This initiative is powered under the blessings of Sri Lanka College of Pediatricians-the apex professional body of childcare in Sri Lanka- with the aim of building a new facility of cardiac and critical care complex to provide timely treatment to all the needy children. 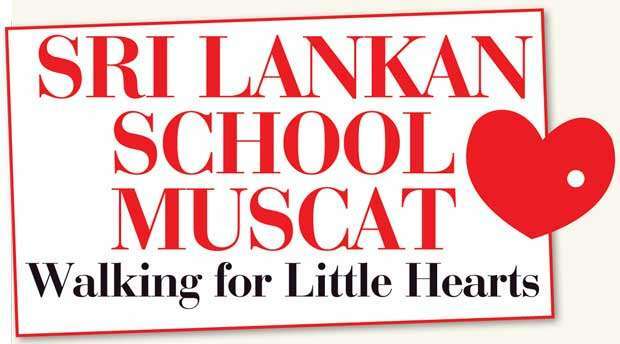 The charity walk is organized by the Sri Lankan School, Muscat as a part of their Corporate Social Responsibility (CSR) move. This CSR project comes to light on the sidelines of the School’s 30th Anniversary celebrations that is to be held on February 12, 2019. "The school anticipates the project would help nurture a sense of obligation and responsibility among its students, apart from their academic commitments." The school anticipates the project would help nurture a sense of obligation and responsibility among its students, apart from their academic commitments. “The school strongly believes in the principle that it is a must to produce academically qualified and down-to-earth individuals, who can understand the hardships of their fellow countrymen and act accordingly towards the needs of their community when their mother country calls them for assistance,” the schools said in a statement. “The Sri Lankan School Muscat is indeed meritoriously pleased to have been able to be a stakeholder of this noble venture. “This move will no doubt pump new life and hope to our very own little hearts to rid from all congenital heart diseases and create a better world for them. “Thus, the School cordially invites all those interested parties to join hands to walk to the hearts of future of our country with a passion to achieve a unified mission,” it said.